A line is a collection of points that extends without limit in a straight formation. 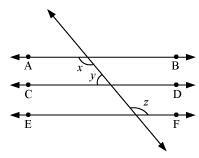 A line can be named by a single letter, like line l, or it can be named according to two points that it contains, like line AB. The second way of naming a line indicates an important property common to all lines: any two points in space determine a line. Technically speaking, an angle is the union of two rays (lines that extend infinitely in just one direction) that share an endpoint (called the vertex of the angle). 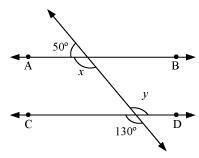 The measure of an angle is how far you must rotate one of the rays such that it coincides with the other. 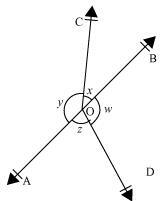 In the given figure, lines AB and CD intersect at O. If and find ∠BOE and reflex ∠COE. 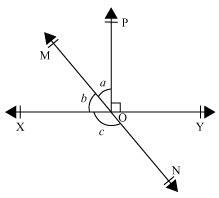 In the given figure, lines XY and MN intersect at O. If ∠POY = and a:b = 2 : 3, find c.
Let the common ratio between a and b be x.
XY is a straight line, rays OM and OP stand on it. MN is a straight line. Ray OX stands on it. In the given figure, ∠ PQR = ∠ PRQ, then prove that ∠ PQS = ∠ PRT. In the given figure, if then prove that AOB is a line. It is given that ∠XYZ = and XY is produced to point P. Draw a figure from the given information. If ray YQ bisects ∠ZYP, find ∠XYQ and reflex ∠QYP. In the given figure, If AB || CD, EF ⊥ CD and ∠ GED = 126º, find ∠ AGE, ∠ GEF and ∠ FGE. In the given figure, if PQ || ST, ∠ PQR = 110º and ∠ RST = 130º, find ∠ QRS. In the given figure, if AB || CD, ∠ APQ = 50º and ∠ PRD = 127º, find x and y. In the given figure, sides QP and RQ of ΔPQR are produced to points S and T respectively. If ∠ SPR = 135º and ∠ PQT = 110º, find ∠ PRQ. In the given figure, ∠ X = 62º, ∠ XYZ = 54º. If YO and ZO are the bisectors of ∠ XYZ and ∠ XZY respectively of ΔXYZ, find ∠ OZY and ∠ YOZ. 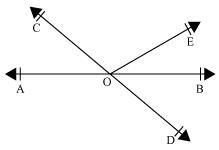 In the given figure, if AB || DE, ∠ BAC = 35º and ∠ CDE = 53º, find ∠ DCE. In the given figure, if lines PQ and RS intersect at point T, such that ∠ PRT = 40º, ∠ RPT = 95º and ∠ TSQ = 75º, find ∠ SQT. In the given figure, if PQ ⊥ PS, PQ || SR, ∠ SQR = 28º and ∠ QRT = 65º, then find the values of x and y. In the given figure, the side QR of ΔPQR is produced to a point S. If the bisectors of ∠PQR and ∠PRS meet at point T, then prove that ∠QTR= ∠QPR. Maths : CBSE NCERT Exercise Solutions for Class 9th for Lines and Angles ( Exercise 6.1, 6.2, 6.3 ) will be available online in PDF book form soon. The solutions are absolutely Free. Soon you will be able to download the solutions.